As a native of Utah, and of Peruvian descent, Bryan began his violin studies at the age of six. At the age of fifteen he made his solo debut with the Utah Symphony Orchestra. 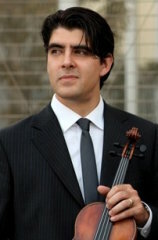 Hailed by the press for his compelling performance at the 2003 Sphinx Competition, Bryan Hernandez-Luch won first place in the senior division while performing with the Detroit Symphony Orchestra. As a Sphinx Laureate, Bryan has appeared with the Cleveland, Atlanta, New Jersey, Utah, Chautauqua, New World, Colorado, Nashville, Grand Rapids, Prince George Philharmonic and Battle Creek symphony orchestras as well as Canada's National Arts Center Orchestra. As a soloist he has worked with such conductors as Franz Welser-Möst, Robert Spano, Keith Lockhart, David Cho, Arthur Fagan and Thomas Wilkins. Also an avid chamber musician, Bryan was the first violinist and founding member of the Sphinx Quartet. The quartet held residence at the inaugural Sphinx Performance Academy at the Walnut Hill School. Their performances have been featured in New York City’s Carnegie Hall - Stern Auditorium and Weill Hall - Chicago, Cleveland, Cincinnati, Detroit and Bermuda. In 2005, the Sphinx Quartet performed alongside the legendary Guarneri String Quartet in a concert honoring their lifetime achievements. Bryan has toured extensively across the U.S., Japan and Korea, as a guest artist with the piano chamber ensemble, The 5 Browns. In 2007, Bryan wrote an arrangement for violinist Gil Shaham and The 5 Browns which can be found on the album, Browns in Blue (RCA Red Seal/Sony). Bryan has studied at the Manhattan School of Music, Brigham Young University, and currently, the University of Utah. Bryan's principal teachers include Hasse Borup, Igor Gruppman, Isaac Malkin and Nell Gotkovsky. He has worked with Itzhak Perlman, Joseph Silverstein and William Preucil. Bryan has also performed in the masterclasses of Aaron Rosand, Cho-Liang Lin, Zvi Zeitlin, Yefim Bronfman and Joseph Fuchs. Active in extended musical studies, Bryan has been a participant in the Music Academy of the West, the Kent/Blossom Music Festival and the Idyllwild Arts Festival, among others. Bryan will be performing in Carnegie Hall’s Stern Auditorium this fall as a violinist of the Catalyst Quartet, which is based in New York City. Bryan resides in Utah with his wife, concert pianist, Desirae Brown.